Raleigh, NC – Since their first concert for young people in 1941, the North Carolina Symphony has been committed to educating and inspiring the next generation of musicians and music lovers. Throughout the year, we work hand-in-hand with outstanding music educators who help carry out the Symphony’s programs in their schools and work every day to build their students’ musical skills and appreciation. 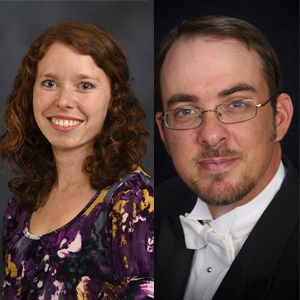 Two NCMEA members are among this year’s honorees. Veronica Allen is the orchestra director at Walter M. Williams High School in Burlington, N.C. She has been awarded the The Maxine Swalin Award for Outstanding Music Educator. She is joined by Eddie Adams, a native of Snow Hill, N.C. Adams, in his 10th year teaching chorus at Raleigh’s Millbrook High School, is this year’s recipient of the Jackson Parkhurst Award for Special Achievement. To learn more about the program and the 2018 honorees, follow the link to the NC Symphony’s article on their website. Congratulations to both Veronica and Eddie!